It’s been so sunny and warm (OK, hot) for so many months and it has barely rained. I’m definitely not complaining. Sunny days are always a good thing. The sun’s brightness and warmth are always good reminders of hope. And it’s also a good excuse for me to wear my rose gold trimmed sunglasses, while enjoying a nice glass of rosé outside. It’s also good for maintaining the tan I’ve had for almost six months now. Though, I look at pictures of myself from a few months ago and realize how much my tan is fading. That kind of bums me out. Oh, who am I kidding? Rainy, cool days are a good excuse to have this soup and listen to Sam Smith and Adele. It’s such a perfect combination and that’s exactly what I’m doing right now. Summer is officially over in a couple of days and it’s been great feeling the sun on my skin and feeling warm on the outside. But on days like today, where I’m having this soup, I feel all warm on the inside. Maybe a little too warm since I squirted one too many squirts of Sriracha in my bowl. Anyway, it’s a nice feeling. The first time I had this soup it reminded me of the Filipino chicken rice soup my mother makes, called arroz caldo. 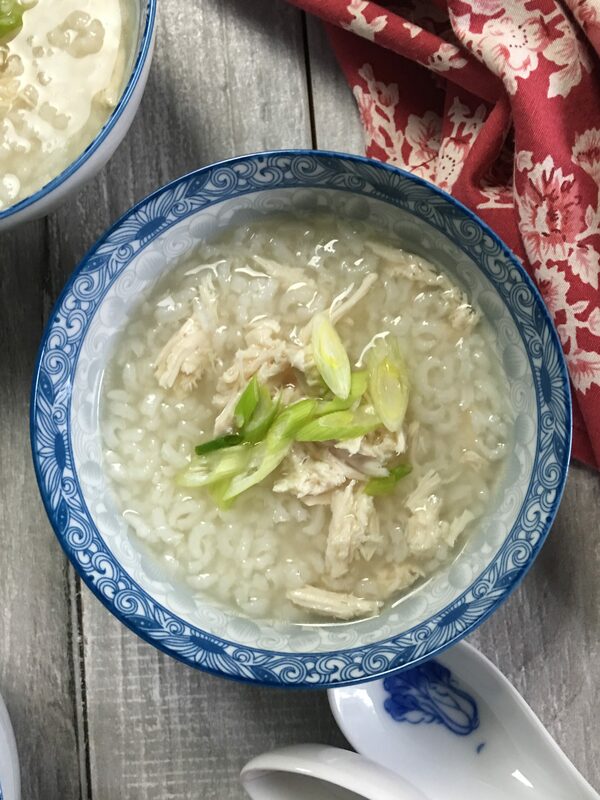 Only this version is more broth-like, where arroz caldo is like a good, hearty porridge, kind of like the Chinese equivalent called jook. And speaking of the broth, the ginger slices infuse it, but don’t overpower it. It’s also easy to double this recipe. Just keep the same amount of chicken and don’t double that. I did it once and there seemed to be way too much chicken. It was like a chicken explosion. OK, it wasn’t that bad. It was just too much chicken for me. 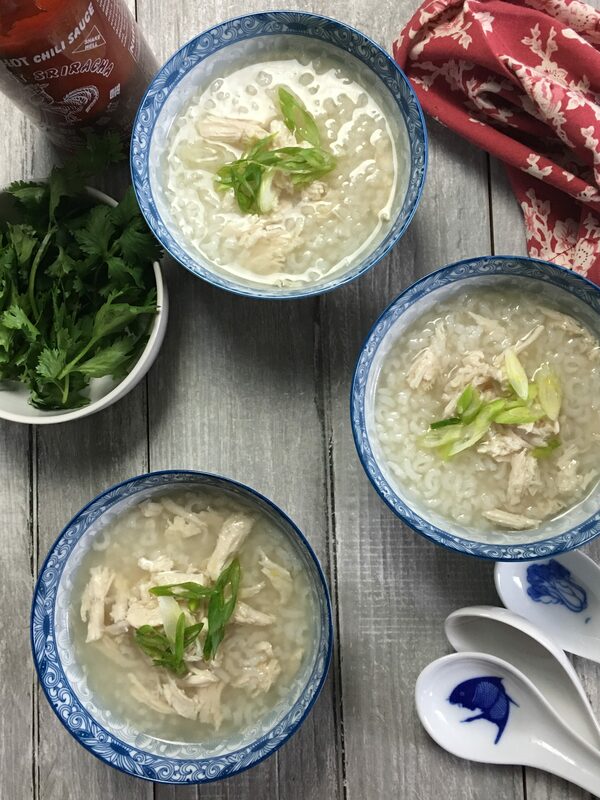 I love this Chicken Soup with Jasmine Rice & Ginger because of the layers of flavors you can add to it. On its own it’s good, but once you add the scallions, the cilantro, and a little (or not so little) amount of Sriracha to your bowl, it’s just makes your taste buds sing. In a medium saucepan, cover the rice with the water. Bring to a boil over high heat. Reduce the heat to low, cover, and simmer until the rice is tender and porridge like, about 25 minutes. In a separate small saucepan, cover the chicken with 1-inch of water. Over medium-high heat, bring to a simmer. When bubbles start foaming around the edge of the pot, reduce heat to medium-low. Continue simmering for about 15 more minutes, until the chicken is cooked through. Once the chicken is done poaching, place on wooden board. Cut in half and shred with two forks. 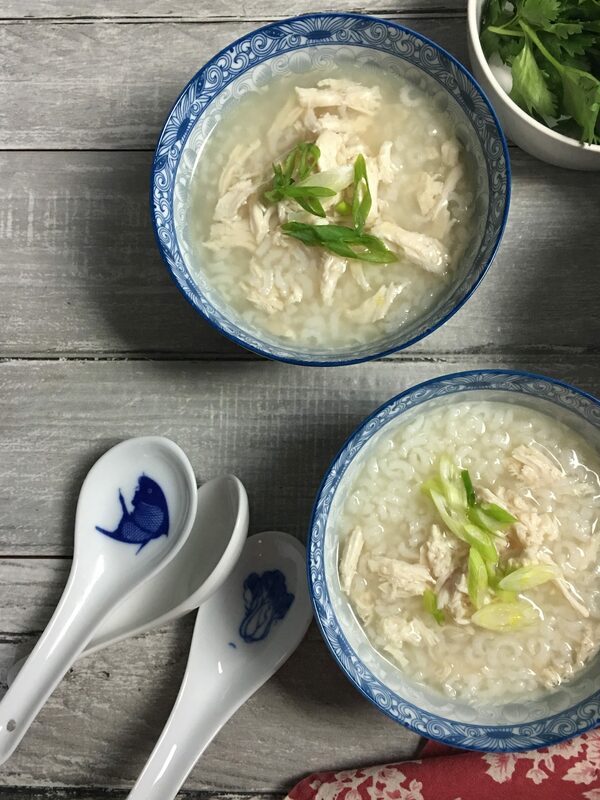 Once the rice is tender and porridge like, add the chicken stock, fish sauce, salt, sugar, and ginger to the rice. Bring to a simmer and continue cooking over low heat for 10 minutes. Stir in the shredded chicken and simmer for 10 minutes longer. 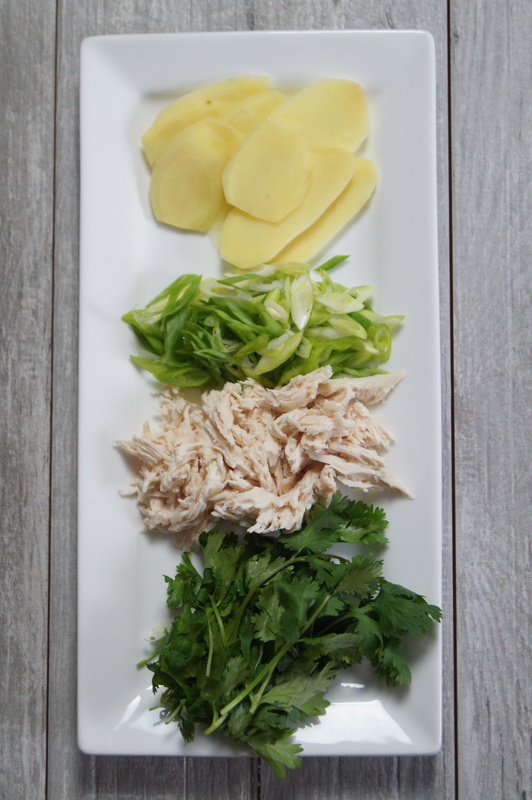 Ladle the soup into bowls, garnish with sliced scallions, chopped cilantro and Sriracha, if using.